Matthew 9:18-26 is often described in laymen's terms as a sandwiching story. In the academic arena, this rhetorical pattern is described as intercalation. Intercalation occurs when a distinctive story is intentionally imbedded between another story, thereby causing an interruption in the story. Intercalation frames the beginning and ending of a story in such a way that they both serve as a commentary on the imbedded narrative. In other words, intercalation frames a story in an A--B--A' pattern, leaving the "A" and "A' " framework to function as a commentary upon "B." This type of rhetorical pattern is actually very common in Scripture, even though it may seem like an unusual method of recording historical events today. And contrary to many liberal accusations of inherent contradictions within the synoptic gospels, rhetorical devices such as intercalation help explain why there are many aesthetic differences (without contradiction) among all three synoptic gospels. For example, in the story of the fig tree that Jesus curses and causes to wither away, Mark uses intercalation, whereas Matthew clearly does not. Matthew has Jesus cursing and withering the fig tree as one combined story, followed by Jesus "cleansing" Herod's temple (Matt. 21:18-19). But in using intercalation (an A--B--A' pattern as a commentary upon the central "B" section), Mark interrupts the story of cursing the fig tree with Jesus "cleansing" Herod's Temple before returning to the story about Jesus causing the fig tree to wither away (Mk. 11:12-14 [A]; 15-19 [B]; 20-21 [A']). The cursing and withering of the fig tree serves as a commentary on Jesus' visitation upon the Temple (and it's future destruction in 70A.D.). B) saying, "My daughter has died just now! 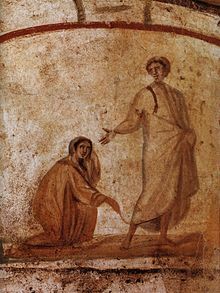 Nevertheless (alla), come (erchomai) place your hand upon her, and she will live." C) And Jesus rose (egeiro) and followed him, with his disciples. a') for she said to herself, "If only I just catch hold of (apto) his garment, I will be saved." b) Jesus turned, and seeing (eidon) her he said, "Have courage, daughter! Your faith has saved (sozo) you." b') And the woman was saved (sozo) from that very moment. C') and the girl arose (eigero), and this news went out into all that district.